Victory Venkatesh for the first time is giving his voice over to Nithin's yet to release film Srinivasa Kalyanam. The film unit has officially shared the actor's pic on thier Twitter Handle. 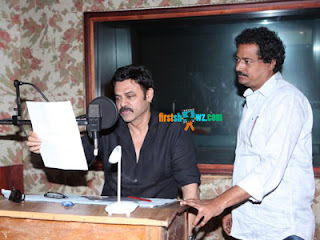 About Venkatesh, "#SrinivasaKalyanam starts with the voice over of Victory Venkatesh garu. Thank you sir for being kind enough to lend your voice." tweets film unit. Currently, Venkatesh is busy shooting for multi-starrer F2 (Fun and Frustration) with Varun Tej in the direction of Anil Ravipudi. Venkatesh will also soon join the sets of Venky Mama multistarrer featuring Naga Chaitanya in lead role. Srinivasa Kalyanam film is directed by Satish Vegesna and produced by Dil Raju under Sri Venkateswara Creations banner. Nithin, Raashi Khanna and Nandita Swetha are seen in key roles.